This Synod has been convened ostensibly on 'the Family' but this has been shown to be a smokescreen. In truth, it has been evidently shown to be about nothing but power, the exercise of power and its misuse. It is not at the service of Christ, nor of His Church. It is not in service to the mission of the Church and it has not been and is not in service to the Family, unless, of course, you want to redefine 'the Family'. Things are being discussed at the Synod that Bishops would not have dared to utter 50 years ago. 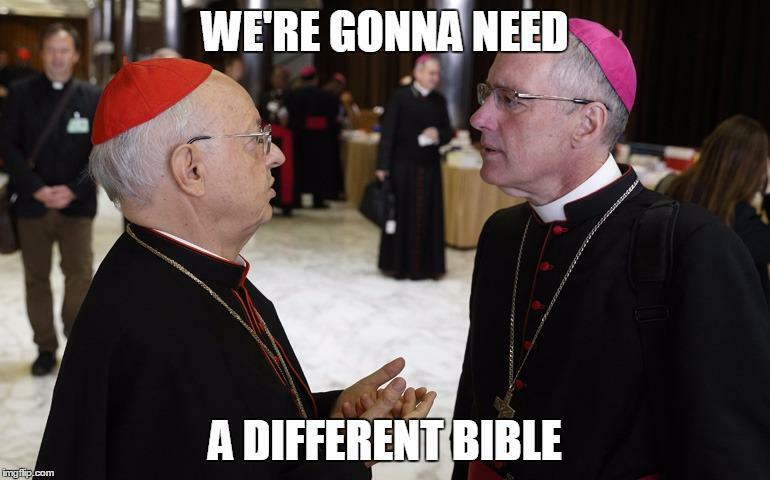 Even the modernists of the 1960s and 1970s wouldn't have dreamed to give credibility to the ideas that liberal Bishops are discussing openly at the Synod and who are being encouraged to do so. 1. Calls for acceptance of the possibility of altering the Church's language on sexual morality. Language Conveys Meaning. If you change the Church's language on sexual morality, you change not only the 'reaction' of your hearers to your message, which you hope will become more palatable, but the very meaning of the Church's teachings - the message itself. If you can really find a way of saying that homosexual acts are wrong without saying they are wrong, by a new and more palatable set of language, you are probably, almost certainly no longer saying that they are wrong, but are, rather, approving them. On the issue of sexual morality, as well as everything else of which He spoke, Jesus Christ Himself was 100% clear, and His words were less 'polite' than the Catechism. In truth, Bishops can already use whatever language they choose to describe the Church's teachings on human sexuality and already they rarely dare to say that which the Church says. What this means for the future of the family, for the future of marriage, the future of the formation of Catholics in the Catholic Faith is unspeakably evil. It would entail a total failure and abnegation of every Catholic's duty to communicate clearly right and wrong on morality, generating anew, generations of Catholics who did not know the Faith, nor how to live it, let alone love it. It goes without saying that in such a new vision of Catholic linguistics, any Bishop or Priest would be isolated and could quickly find himself censured for speaking clearly as Christ and His Apostles did according to the Word of God. Aside from the heinous promotion of Eucharistic sacrilege and further endangering the souls within the Church's care, this is nothing other than a direct assault on the Catholicity of the Church Herself. The Church cannot be One, Holy and Catholic if from country to country Bishops' Conferences, because of the Pope's acceptance of it, abrogate to themselves, in complete defiance of their Lord and Saviour, Jesus Christ, a manufactured 'right' to break - and publicly so - the bonds of Universal communion with their brethren, the Successors of the Apostles, around the World, or, even, in a neighbouring Diocese. What an opportunity this Synod on the Family was for the Catholic Church and what an insult to Jesus Christ it has become, but for those faithful Bishops and Cardinals who are standing up in order to defend Him and His Teachings as well as His Bride. Yet from the outset, the opportunity for the Pope and the Bishops to proclaim anew the beauty of the Catholic Church's teachings on marriage and the family has been crushed and discarded, always being re-diverted back to issues that it is not within the Church's power to solve. For 2,000 years, of persecution and of temporal ascendancy, the Catholic Church has taught that man's primary need, his deepest desire, even, yes, his duty, is to know, love and serve Almighty God. The happiness that we seek as creatures does not revolve around the fulfillment of temporal pleasures. The Church has taught always that God, alone, can satisfy the human heart. Our deepest yearning is communion and Union with God. That the Catholic Church should seek to promote or encourage, even a little bit, the notion that our relationship with Almighty God is of lesser importance than questions on earthly satisfaction that can never satisfy us is scandalous in the extreme. 'What would it profit a man," said Our Blessed Lord, "if he gained the whole world, but suffered the loss of his immortal soul?" Through good and holy priests and the the teachings of some holy prelates, through the teachings of Popes, through the teachings of the Church, in all their clarity and truth, through attending Holy Mass, through receiving Jesus Christ in the Holy Eucharist and frequenting the Sacraments of Confession, through reading Holy Scripture and holy books, through holy friendship, through a community of faith, through holy liturgy and prayer, through the Sacrament of Marriage, even though until my dying breath, I will be a poor sinner in the eyes of God, I am living in the grace of God and I can hope for mercy, if I am merciful. What good is in me, what good I do, belongs entirely to God and if I but let Him, God will, in time, refashion me His own image. In having nourished me with the truth and all the above, in serving God, the Church has served me. Please, do not consider, for one moment, of depriving a single soul from all that the Catholic Church has given me. because She, like Her Lord, has loved me with love beyond all telling, so that I can say that nothing - nothing - is more important to a man than God and the Salvation He has to offer. But will anyone in the new, shining vision of 'Church' envisaged by the reformers manipulating the Synod find his way to the Truth if the Church does everything it can to deprive him of the truth? Will a man be able to find Jesus Christ's teachings without the Church offering them to him in language that is clear and challenging, that calls him to repentance? Will a man be able to find the Truth anywhere? 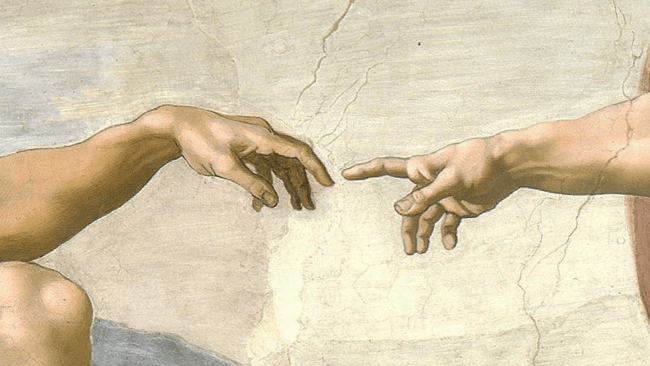 Why would a man wish to put God first if the Church encourages him not to bother? Why would a man reform his life with God's grace, if the Church says his life is fine as it is? How will a man or woman dedicate themselves daily to overcome sin if the Church tells them not to bother, its all fine really? The power that the Church has to offer is truth, to reveal to mankind He Who is full of grace and truth and to reveal to mankind who he is. It is not for man to tell God what He is, or for man to tell God what he himself is. It does not have the power to redesign reality. It does not have the power to transmit falsehood and to deceive. It does not have the power to alter Jesus Christ's Teachings by, in principle, simply agreeing to the World's terms, by adopting the World's own language - a language which is itself duplicitous and deceptive. Such powers as this are simply the fantasies of sinful men in positions of power who forget God. Men can abuse their positions of authority to do these things, but such things can never come from God. To manipulate, to deceive, to intimidate and to abuse authority, these are not virtues. Faithful Bishops and faithful Cardinals who refuse to adopt, into their ministry and into their Dioceses the terrible errors beings promoted and encouraged (even by the Pope) within the walls of Synod Hall will say everything they possibly can - in the now feint hope of being heard, to persuade the orchestrators of this Synod that the Church must remain in total fidelity to Jesus Christ, but if they are not listened to, before the Synod ends, it does no harm to the fabric of the Church to walk out of the Synod Hall in refusal to be present at an event that encourages, defends or even, at times, glamourises sin. Why? Because, in truth, if they are not listened to, if they are derided, if they are ignored, if they are defamed, if they are bullied, if they are muzzled, if they walk out of that Hall, the Church walks with them. If then they are listened to, if then they are taken seriously, then it is the Church which welcomes them back in. Very beautiful. Thank you. You are the Lord's good servant. This synod is a bit like VII. VII actually changed the language of what 'Church' means (fundamental/substantial), thereby creating a new ecclesiology. That an apostate institution founded upon a schismatic Council should then fabricate a new 'familiology' is not so surprising. What is surprising is that the sensus fedei of the would-be Catholic is still kidnapped by this beast, the fruits of which are a new ecclesiology, anti-social-Kingship-of-Christ, along with its genocide of the Roman Rites, not to mention the mass-murder of the convent and the seminary, let alone the Wojtyla child-abuse 'management' years. And even more, God permits such an obvious anti-catholic pretender like Bergoglio to befoul the Throne along with countless antichrist revolutionary post-Incarnational 'theologians'(I put 'theologians' in quotes 'cause if these blokes ain't athiests, pigs don't grunt), and still the 'idol of Catholicism' (courtesy of Protestants, and Rabbinicalism et al) is more magnetic than Her visible, One, Holy, Catholic and Apostolic - if much diminished- presence. Your protest against Protestantism, is maybe not the problem. This synod has been imbued with evil - manifestly so - from the beginning. It should have been denounced by true Catholic bishops and priests long ago. The scandal is destroying any Faith and morals left among the lukewarm or ignorant. Thank you for drawing our attention to this. I hope other bloggers will do the same, since we know from experience that this will draw out many more signiatures.It is so saddening but necessary that we have to do this. But perhaps if many more people will sign then it will give the Bishops the support they need to do what they have to to stop this sham. As a parent of teenagers I feel so utterly betrayed. What am I supposed to say the them now? There are lots of you out there who know so much- and you Laurence. Can anyone tell me am I bound, as a Catholic to believe whatever the final document of the Synod says? Please, there must be some priests reading this too. I feel 'fatherless' because of the silence. Tell us what to believe. I, like others, am just trying to be faithful and teach my children the same. Dear Anon, Catholicism is not complicated. It never contradicts reason. The Deposit of Faith and the Natural Moral Law cannot change - they are true everywhere for all time. Anything that contradicts that which has gone before is false and to be rejected. Stick with pre-VII documents and you can't go wrong. It was after VII generally, that documents from the Holy See, the Council, etc., began to purport to change what had always been taught - Tradition (What has been handed down from the Apostles and is to be handed on unchanged, intact). God bless and preserve you and your family in the One True Catholic and Apostolic Faith. Your sister in Christ. Yes, the Catholic Church serves mankind, but it serves God first. Indeed! By serving God first, she serves mankind. Excellent post! This kind of stuff is what the clergy *should* be saying! It would be a disaster for orthodox Bishops to walk out of the Synod. They are in the overwhelming majority, as was shown by the voting in the previous session, and will, if given a proper chance, uphold Christ's teaching. The big question is whether they will be given that chance. If not then the Synod will be totally discredited. The very basis of the petition was mendacious. It was a setup; all one who did not walk out would, by definition, be 'unfaithful' and could then be denounced. I'm appalled anyone - especially a Catholic priest - considered it for a moment. It's a product of the Father of Lies and the Lord of Misrule. How could any faithful Catholic be taken in for a moment? Has hatred of Pope Francis really gone this far?